Often found in early newspapers of the 18th century are articles of interest printed in London and then reprinted here in the colonies. A little slower than the internet, but an effective way to keep up with world events, politics, news of note, and gossip. 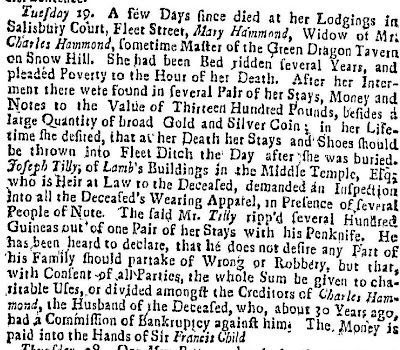 Mary Hammond, a widow of a bankrupt man, pleaded poverty up until the end of her life. She left instructions that her stays and shoes were to be thrown into a ditch upon her death. A suspicious heir- in- law, decided to investigate and upon splitting open the stays found money and notes to the value of 1300 l. as well as a quantity of silver and gold coins. As a personal item, with connotations of intimacy, the stays were obviously not handled by anyone else in the household as the sheer weight of gold and silver coins would have revealed that the stays were being used as a safety deposit box, hiding assets from creditors as well as family members. 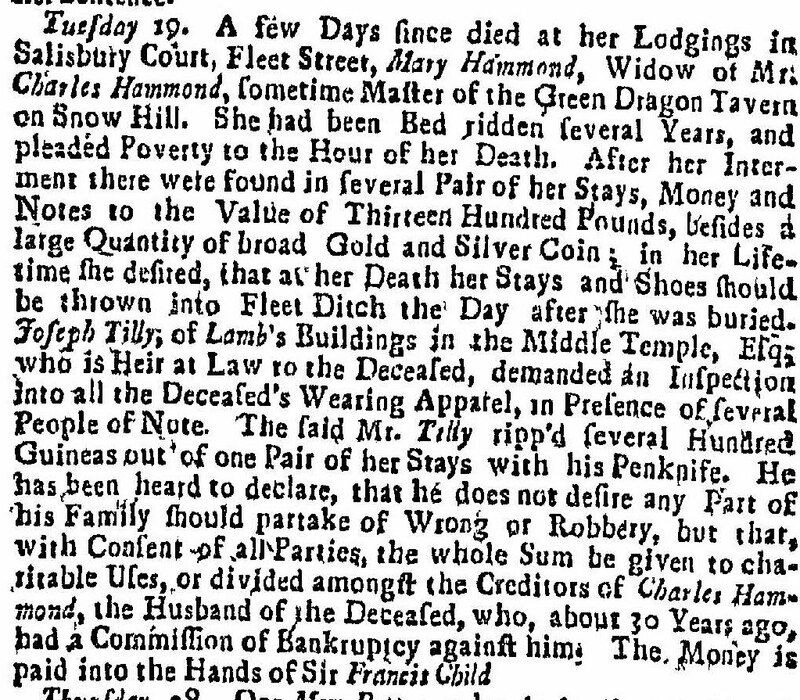 From the London Magazine for July 1737 and reprinted in the Boston Gazette, September 26, 1737. Hallie, it's also interesting to note that as a "poor" widow, she had "several pair of stays!" And the other curious thing is... why did she want her shoes thrown into a ditch? I wonder if the relative checked them, as well! It does make you wonder what was in the shoes! We will never know the rest of the story, but what a sad life to want to throw your money away rather than pay your bills and take care of family.